I am so thrilled to announce that my (Melynda's) Mom, Yvonne, was able to finally make the trip down here to the Dom inican Republic to visit us. We have been here over three and and half years and she asked that her Christmas present be a trip down to see us. I can't tell you how exciting this was on so many fronts. For one she was able to get a release by her neurologist to travel here which is a HUGE indication of the healing that has occured in her. Thanks only to the Jehovah Rapha - our Healer. Second, she was able to see for herself where we live and what we do which helped her to set her mind at rest and made it easier for her to give us her blessing in being here. Don't get me wrong... she has understood and supported us but this has brought it to a whole new level. We had a great time the day that she arrived. We waited until she arrived to celebrate Matthew's 16t h birthday. We went to eat at Wendy's. **Sidenote** For those of you who take Wendy's for granted...think again. There is only one in the whole country right now and it doesn't have a 99 cent menu so it is a real treat for us to go there. After the visit to Wendy's we went bowling...again only one bowling alley here. We had a blast. 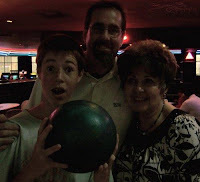 My mom hasn't bowled in over 30 years but she had great form! We did a lot of laughing and high fives all around. Isaiah wants to go back for his b-day at the end of the month of March. As a combo gift we were able to go up to the North-western shore of Samana to go whale-watching. The Humpback Whales come every year for b reeding and birthing in the bay. The prayer is always that you will actually be able to find and observe them when you go out on the boat. It was our priviledge to be able to go out with a Marine-biologist who was able to give us an in-depth and interesting background on the whales. Our prayers to see whales were answered in a BIG way...not only did we see a mother with three babies but we also got to see two males chasing each other and bumping each other in a battle to win a female to mate with. It was a once-in-a-lifetime event. They were so big measuring about 50 feet long and weighing about 40 tons! God is so creative! They moved with such grace through the water and it was amazing to see them jump. Needless to say it was an amzing week and to top it off my Mom said that she was proud of the work we are doing here and she understands why it is that we can't leave. While we miss our family and friends our heart is here in the D.R. and in what God has called us to do. We love you Mom (a.k.a. Mema) and we miss you!